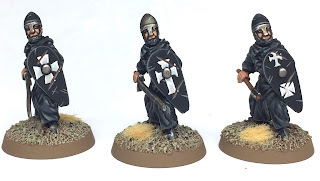 With my latest campaign of Outremer: Faith and Blood underway my output of models has increased exponentially. 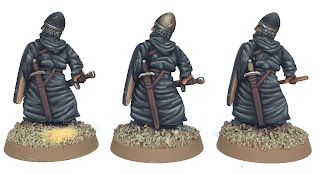 Given that in our most recent game my Military Order Warlord (Turcopolier) managed to incur an injury that prevents him from carrying a shield I have had to replace the model that represents him. As such I have painted these two figures. The one on the left will be my commander from now on, and when I have a few spare Livres I will give him a banner and then use the fighter on the right. 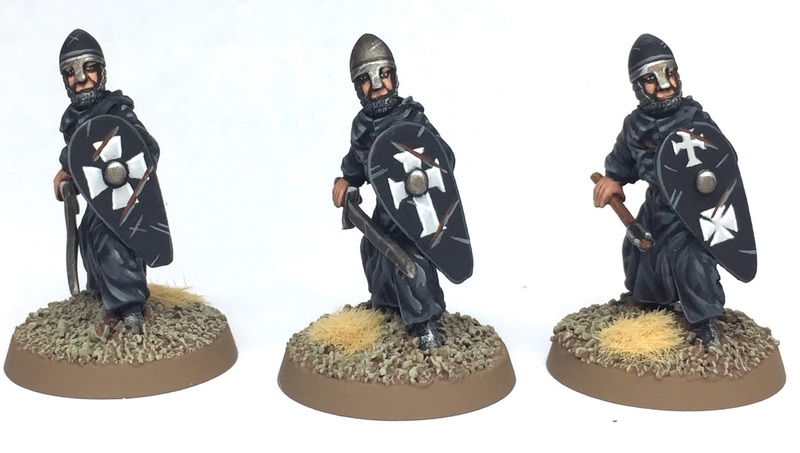 I really enjoy playing Outremer and watching my warband develop over time. The character development is one of the best bits of the game for me! I have a few more games booked in for the next few weeks with my mates so I’m looking forward to seeing how my brave band of fighters performs. Deus Vult. 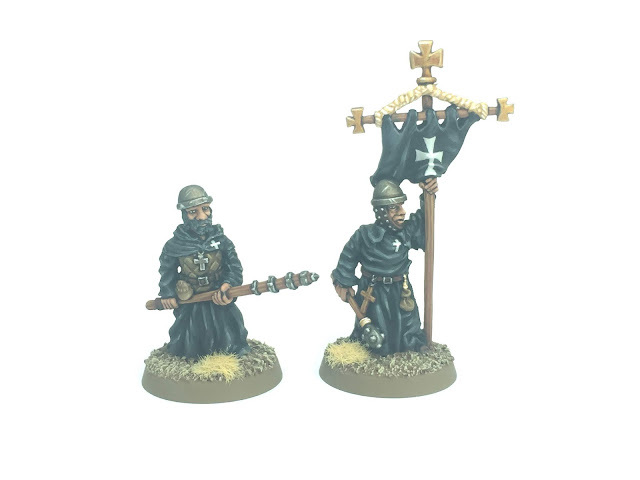 My force is based on the early years of the Order and so are clad in black monastic robes, whilst my opponent’s Hospitallers are from a later era and so are wearing the red surcoats instead. I have spent the last few weeks working on some more Hospitallers for my growing Military Order Force for Outremer. Now that I have a campaign in progress with a couple of my closest mates I need additional models so that I can swap loadouts between games and also upgrade/replace fighters as needed. 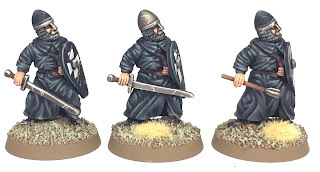 First up I have three new sergeants to provide both some solid melee capabilities and potent ranged lethality in the form of a crossbow. Whilst sergeants are useful assets it must be said that the heart of all the Militaey Orders are their knights and so I have also painted three new Hospitaller Knight-Brothers. These are all based around the same 25mm sculpt from Essex Games and so I have used variations in helmet colour and shield iconography to differentiate the fighters. I really enjoyed working on these individual shield designs and it was really rewarding to see how well they came out! I have a few games planned tomorrow so I’m looking forward to seeing how these new recruits fair on the battlefield!! Hopefully they will secure me victory in the name of God and The Hospital! Outremer Battles over the Weekend! 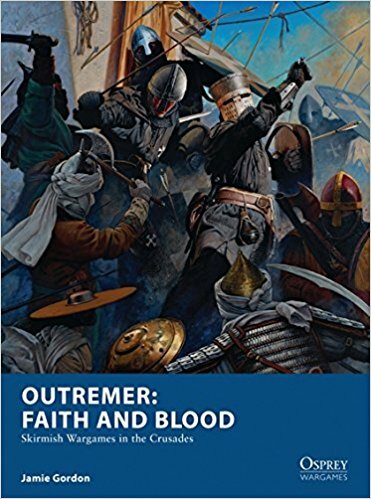 So I am pleased to have had a great experience of playing Outremer: Faith and Blood this weekend. 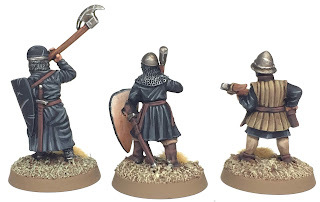 My best mate and I are starting a new campaign and are looking forward to following our warbands careers as they develop over the course of the next few months. As my mate hasn’t been doing much wargaming recently due to personal commitments I chose both our initial starting forces. I chose to make these starting forces identical in order to keep things both fair and easy for him to learn. 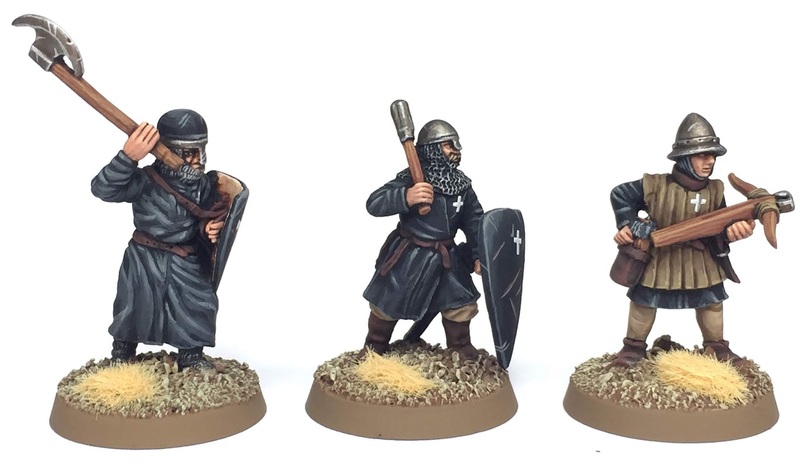 I chose two fairly small, compact but elite forces of crusader infantry with a lot of armour and extra equipment. This meant we both started with just five models who were already accomplished fighters. Our first game was the Skirmish Scenario from the rulebook. As expected this encounter was suitably bloody with both of us having only one model standing at the conclusion of the battle. We called this a draw and awarded our warbands experience points, cash earned and lasting injuries as appropriate. 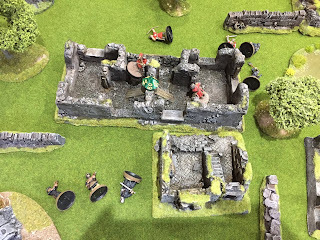 The second game was Capture the Flag which is a great scenario for forcing both players to get involved in melee in the centre of the table. It was a pretty even game for the majority of the battle, but in the last turn I managed to roll the dice well which secured my overall victory. Once again we awarded the experience and money that had been earned as well as the legacy of any injuries taken. Even after a couple of battles the forces were starting to develop a character of their own, with the various fighters beginning to have their own bespoke backstories. This was great fun... and I can’t wait to see how the campaign progresses. 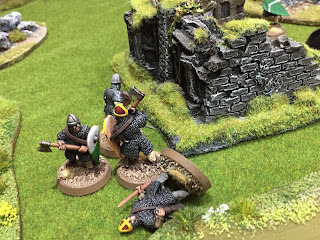 I have included some photos of the warbands in action below! Warming Weekend and Vaunted Return!! So after a long (unavoidable) hiatus due to unforeseen work commitments I am back and keen to play some Outremer: Faith and Blood. As such I am busy organising a gaming weekend in a few weeks for me and some of my original UK based play testers to build up our warbands over a linked campaign which I am immensely looking forward to. 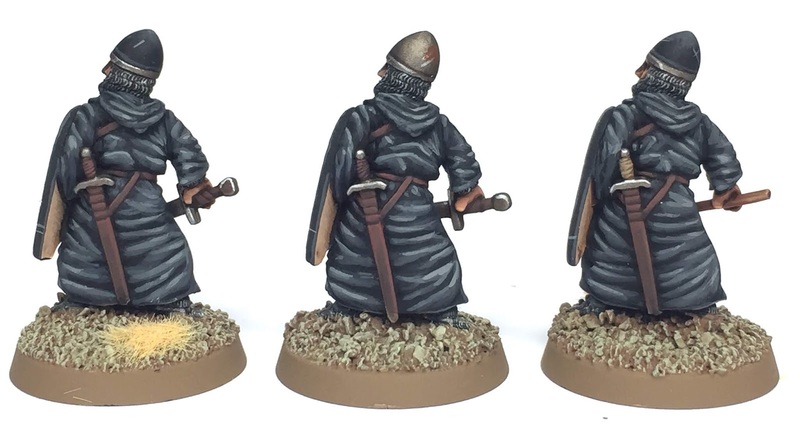 I will even be using my potent mercenary foot knight that I painted for a magazine article last year to reinforce my Crusader Warband. Finally I am pleased to say that my family issues seem to be moving towards some form of resolution and thus I can put some more time back into supporting the ever growing number of Outremer players. Hi all. Just a quick one to apologise for my absence; initially I was away with my day job, but have since returned to find that my mother is seriously unwell. Needless to say this has taken priority and I have been arranging her care needs. I have been reading everyone’s comments questions and posts and rest assured I will get around to answering them as soon as I can. Again please accept my apologies for the break in communications. As an aside I hope you’re all having some really great games of Outremer!! Outremer in the Press... Again! 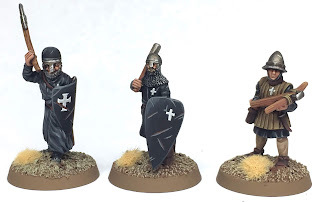 This is the official blog of Outremer: Faith and Blood, a skirmish wargame set during the Crusades and published by Osprey Games. It is designed to act as a hub for the Outremer Community and to allow me the author to address queries as well as release occasional updates and additional contents.